Bali V-new is a magnificent new property with 40 metres of beach-front onto the Bali Sea - a beautiful, calm and safe beach. The location is rural and secluded, but only a few kilometres from Lovina with its restaurants, bars, live music and activities such as diving. Here, you can stay in and enjoy the pools, the TV channels and video library, the broadband Internet connection and more. Or you can go out exploring North Bali with its coral reefs and dolphins, the hot springs and waterfalls, the restaurants and music venues, the hills and gardens, the West Bali National Park and East Java. Optionally you can rent the complete villa with the 3 bedrooms and staff (housekeeper, gardener and security) andhave exclusive use of the modern western kitchen, the home cinema, the 18 metre pool and Jacuzzi. The bedrooms are air-conditioned, and the living areas are open plan with fans. There is an 18 metre pool with integrated Jacuzzi. A home cinema offers a large screen, surround sound, large DVD library and satellite TV channels. The kitchen is modern with large refrigerator (with ice), microwave, gas oven and dish washer. All rooms are large and air conditioned. Two have indoor/outdoor bathrooms with open-air shower. 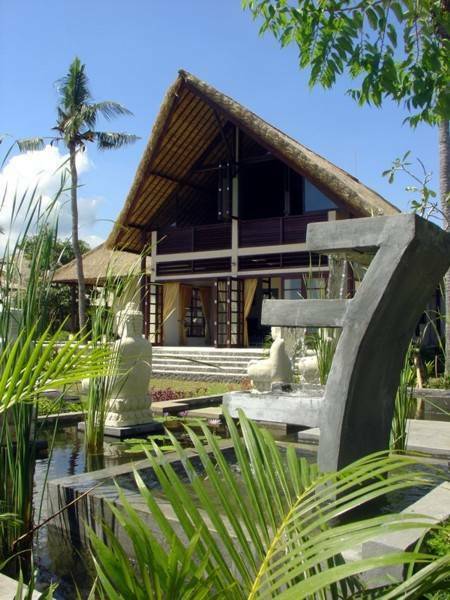 Bali V-new is on the beach and is surrounded by banana plantations, vineyards and rice fields. If cancelled less than 1 week prior to check in, then one night's accommodation will be charged. From Denpasar airport take the Ngurah Rai by-pass road throug Sanur and follow signs for Gilimanuk & Singaraja. About 15 Km north of Denpasar turn right for Singaraja, then follow this road north through Bedugul to Singaraja. Turn left and travel 10 Km west to Lovina, and another 6 Km west to Temukus. One Km past the centre of Temukus, Jalan Tulip is on the right. Visit balivnew for maps and more detailed directions. Taxis from the airport for the 100 Km trip cost under US$50. Perama buses are available from Jalan Legian in Kuta. Many transport operators will offer minibus services and are happy to bargain. Nearest airport: Ngurah Rai Airport, Denpasar, Bali.